Ever since I picked up a telephoto lens and aimed it at my first non-human earthling, my seasons have morphed into migration schedules. Winter = Ducks. Spring= Babies. Fall (best time of all) = Shorebirds. I used to be an urban-girl-night-person — before I knew what I was. Autumn was: early darkness, early cocktails. Schlepping out a camera and tripod at the crack of dawn is a significant metamorphosis. Shorebird Nation is now a phenomenon for me. They arrive in such numbers that come October, you’ll encounter flocks of mixed birds so huge they deserve nation status in the avian world. I came upon this particular flock on my way home from Oakland Airport at the head of a storm. I stopped at the wildlife enclave known as Arrowhead Marsh, so named for its distinctive shape jutting into San Leandro Bay. The marsh was once open bay, according to 19th century maps. It probably grew from sediment washed down San Leandro Creek during hydraulic mining operations in the late 1800s. 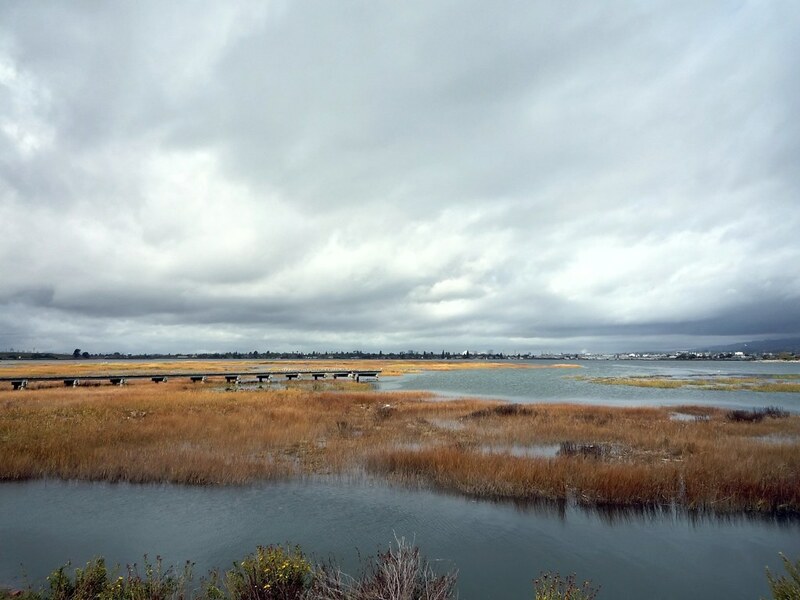 Arrowhead Marsh is a critical habitat for the Endangered California Clapper Rail. The USGS Clapper Rail radio tagging we saw last year happened precisely at this spot. I saw a cluster of shorebirds at the end of the dock. I gradually made my way to the start of the dock where I knew I wouldn’t disturb them. I planted myself there with my camera, thinking I’d take a few distant shots and leave them be. Shorebirds will flush on queue if they see a raptor overhead or any other perceived danger. I did a few test shots which bothered them none. A flock of Willets swooped in at the back and nudged the crowd a few inches toward me. Then another flock, this time Marbled Godwits, their pink bills wedged in among the Willets. Group after group descended on the dock, alternately nudging or shoving the entire mass of birds forward until the front line was almost within arm’s reach. These are emotional moments in my outings. Last year, a flock of plovers clustered around me and slept on a lonely beach where I’d been a fixture for an hour. There’s a fragile detente in that space between me and them. They have much more to lose in a betrayal than do I — so any sudden move will, understandably, send them flying. I am mindful of this relationship and of my place in it. I always depart with gratitude for those moments of connection . . . a true gift from the Shorebird Nation. Hi, my sister ran into your page (shorebird nation rises again), and I just loved it! Your photos are wonderful, you should sell them on ETSY!